The "new" or "lower" granary was specifically built upon the duke’s particular orders during the period 1477/78. The grain contributed by the subjects obligated to crop "tithe" was stored on four large-scale storage surfaces arranged on top of each other. During the War of the Austrian Succession in 1743 the building suffered severe damage as a result of pillage. 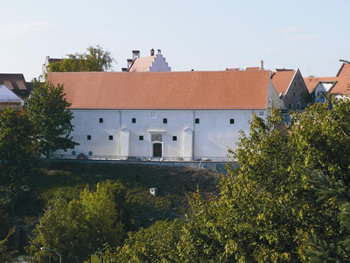 Rebuilt in 1750, the building was then used by the government as a granary until 1849. Ten years later, in 1859, the building was purchased by the town and put on lease. Following numerous discussions on how to put the granary to best use it was finally decided in 1886 to convert it into a school house. After extensive reconstruction work, the Boys’ School was finally opened in 1892 and were used till the year 2003. After more than 100 years of serving as a school, the former granary comenced it's new function as a museum. The stages of industrial development of the City of Dingolfing are now on display here with more than 1,000 square meters of presentation space. A development shaped and influenced by the automobile manufacturer Glas, which is unique to our country and is shown to best advantage at the original location in Dingolfing.